New to sourdough baking? Need to make a sourdough starter? There is so much conflicting information that it's easy to get confused. Like any other art, there are many ways and styles to obtain your final object - which happens to be a great loaf of artisan sourdough bread. The following method for making a sourdough starter isn't the only method, but I've been teaching sourdough baking for a lot of years and I'm hoping you will find it easy enough to follow so you can get started right away. First you will need a sourdough starter. Sourdough or wild yeast is a culture of micro-organisms, including yeasts, bacteria and enzymes. These micro-organisms are cultured from the outside of the grains. Whole grains are covered in these micro-organisms and once the grains are ground into flour, the flour contains them too. Whole grains have a lot more micro-organisms then white flour does and bleached flour has even less. So to get started we need to make a culture of these micro-organisms, we call it a "sourdough starter." Quite simply and easily, you can mix flour and water and then allow it to set for a day or two until it begins to bubble or ferment and then discard some and feed the rest. You will find many different ways and methods to do this, but it isn't hard, just pick one way and stick with it until at least a week goes by two weeks is even better because the starter should be stable by then. 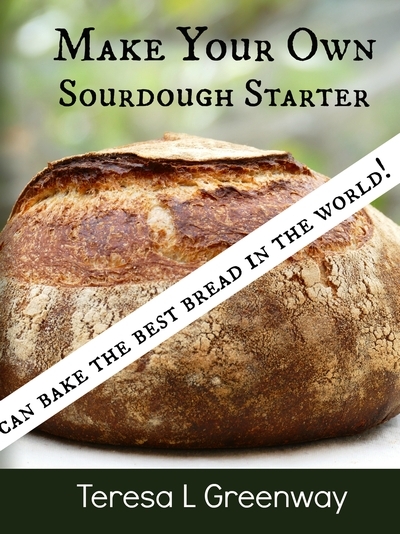 Following is a day by day video method for making your sourdough starter by the time it's finished you will have made your first loaf of sourdough bread. I kept the starters in a 70F/20C proofer (warming box) so I only fed them once a day. Feed your starter more often if your kitchen is warmer. Sign up to our newsletter and receive this free book download. Start Your Sourdough Journey Now! Many directions will have you pour out half the starter after it begins to ferment and then feed it at least every 24 hours. However, if you live where it's warm (above 72F/22C) it is better to feed your starter every twelve hours and to pour out more than half so that the starter's food lasts longer. If you leave your starter at room temperature, it's actually better and healthier for the starter to feed it every 12 hours. If you wish to avoid waste, use your sourdough discard to make pancakes, flapjacks, muffins, waffles, biscuits etc. You can also keep just a small amount of starter and feed it more before using it to bake.